This post might not be for the squeamish or vegetarians, whom I have a lot of respect for, but I am, a meat eater, and I worry about where my meat comes from and how it was raised. If you haven't asked yourself these questions yet then I suggest you watch Food Inc or read Omnivores Dilemma. Where our meat comes from and how it is raised is a bit of an issue today because our typical mode of buying meat leads us to pre-packed lumps of protein sitting in a cold chest with labels to remind us which species of animal it belongs to. When I embarked on this slow food journey sourcing local and ethically raised meat was the one part which really worried me the most. Obviously there was no way I was going to get away with starting a small farm in the back yard so I had to research. Firstly I found a good set of resources online, Niman Ranch was my first find and these guys do an awesome job and provide a great service. Secondly there are the local farmers markets where some producers sell grass fed and humanely reared meat and finally I live just down the road from a large Wholefoods who at least tell me where the meat is from. All of these sources are convenient but they can be expensive. Then, by accident, I found Windsor Family Farms, a very small farm just 40 mins away from Cupertino in San Martin. The farm is run by Kim and Kyle Windsor (and their children) is what would be called a small holding in the UK, they rear a few animals really well with the care and respect that leads to the best possible health and eventually meat. Buying meat direct from a farm may seem like a scary deal but it actually turned out to be quite painless. It is best to do a bit research on the animal your buying and at least know the main cuts (known as the prime cuts) and preparations. You will also need a freezer, not as large as you might think but you will need one. In case you are thinking that at some point a dead animal will end up on your doorstep, or perhaps worse a live one, for you to deal with! Don't panic it isn't like this at all. When the animal is due to go to slaughter (and the exact time will depend on the how Farmer thinks the animal is doing) you get a notification to prepare yourself. This is a time to clear out all those left overs from your freezer. The next thing that happens is, you call the butcher that receives the animal (or they will call you). All local meat producers work with a local butcher who will prepare the meat how you want it (yes you can have it your way!) in the case of Windsor they use Freedom Meats in Freedom near Watsonville (an excellent butcher and curer of meat). The butcher will prepare the meat into the cuts, turn the trimmings into mince and basically do what you want. Freedom will even cured your hams, and make your bacon (assuming you are picking up a pig). They flash freeze and box it up for you to collect. That is it! Costs factored as follows, there is a live weight fee for the animal and nominal slaughter fee (goes to the producer) and then the costs of Butchering. However when you factor in everything your Pork is going to cost around $3:50 - $5.00 per pound depending on how much work you want the butcher to do (this year for grass fed beef I paid about $7.00 per pound). Which is a deal! and if you have freezer a good way to go and the meat is absolutely top notch. The Windsors deal mainly in pigs, they do have a steer occasionally. I have also found a couple of larger local farms, well ranches in the area. Morris Grass Fed Beef in San Juan Batista and Paicines Ranch in Paicines CA. These operate in a similar fashion to Windsor but on a larger scale and they deliver the butchered meat straight from the farm. Paicines also operate a meat CSA through Eat with the Seasons. Typically there is a minimum order for delivery and an upfront deposit. The larger farms such as Paicines will allow you buy cuts of meat ala-cart but the prices go up considerable, buying in bulk gets the best price. Going directly to the source of your meat is great experience, you get to the see the passion and care these people put into rearing they animals and you get to understand the process and most important just who is messing with your meat!! if you live in the Cupertino area I encourage you to check out the resources above, if not then do some research on local producers in your area. So in a week of so I expect a call from Freedom telling me my hog is ready. I have them do minimal processing because I like to do my own curing and sausage making which I will post about during the year. I also enjoy the offal which isn't for everyone but I would say you haven't tasted the real stuff until you have had it fresh. 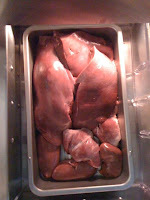 Offal needs to be eaten or processed with 72 hrs of slaughter. One really nice thing about working directly with the farmer is that you can get the offal fresh. I picked up the offal from my Hog last weekend and spent a day prepping it and turning it into yummy things can be frozen without losing the quality or texture. The main parts I use is the heart, liver and kidneys. I made two family favorites, a rich liver pâté, and a dish from back in the UK which has an unfortunate name, one that is used in a derogatory sense in the US. So here I mean it in the culinary sense, this dish is called Faggots which are savory dumplings made from the liver and the heart mixed with herbs and spices (recipes available on request) and delicious with onion gravy and peas.. So more on the pig story when rest arrives, can't wait!. One issue of trying to adopt a more seasonal approach to the food you eat is sourcing the raw materials. This is certainly step one and once you make it It is all down hill. A movement towards "slow food" rather than the existing industrial processed food you find in your local mega-mart is a bit of a commitment but if you are reading this then you are hopefully thinking of making a start down that path. So this post is about Vegetables, and although some might describe veggies as the stuff that food eats!, you are spoiled for choice living in the bay area as compared to other parts of the US. There are an astonishing number of tasty veggies which grow local but never even make it to your supermarkets and as you dig into where and what you are eating you will be surprised just what you have been missing. So on to Veggies and how to find them in season and from local producers. There are three main ways of accomplishing this depending on how much time and control you want to exert. For myself I have reached a point in my journey where I use all three but just choosing one of the following methods will get you started on your slow feed adventure. This option is the one requiring the least commitment but there is some up front work to set it up. Basically having someone pack up a bunch of local in-season veggies into a box or bag and dropping them on your doorstep, or to a local drop point for you to pick up. No fuss, no mess, no queuing. These schemes are called CSA's or more formally community supported agriculture. There are a number of such schemes out there and they typically require an upfront fee in order to secure the goods. These schemes vary from single farms to cooperatives working with many local producers. Many offer dairy and meat products along with the veggie boxes. The good news is that in the bay there are quite a few CSA's available for you to choose from, the trick is finding them. Well the best way I have found is to use the excellent resources of Local Harvest (http://www.localharvest.org/). The Local Harvest website provides a simple web form where you can click to find CSA's operating in your area and get a decent overview of the kind of service they. Note that some schemes do not allow for cancellation for vacation periods, and they often don't operate year round. My particular Food Hero in this category is Eat with the Seasons a CSA/Coopertive working in the Bay Area. I have been using this particular service for the last three years and can recommend them. They have nice features which are not found in all CSA schemes. Each week they send you by email a list of seasonal produce from which you can select what you would like. They also include local dairy products and also meat through the excellent Pacines Ranch. The other nice feature they have is that you can cancel or donate your order (should you be out of town) and finally they provide weekly recipes for the produce they are providing. This is a step up in commitment from a CSA in that you actually have to get in your favorite means of transport and travel (on a weekly basis), then browse and shop for what you want or more accurately what is available. You have a lot more control but you have to make time to go and choose. There are a number of farmers markets in the Cupertino area and they are all fairly similar, in fact many of the same vendors go to all the local venues. To find one near you and the times of operations the previously mentioned Local Harvest comes to the rescue again, although it is best to check the local city website to double check the information as times and locations do change. A few things to consider when going to a farmers market, well it is pointless making a list! Part of the fun is discovery. Take a bag to put your produce in, and take cash rather than plastic to pay. Finally if you see something you don't recognize, ask the producer who will be only too happy to tell you what it is, give you a taste and even whip out a family recipe for you to take with you. The other fun thing about farmers markets are the samplers, I swear you eat your 5 a day there. My favorite in the Cupertino area (is sadly not the one in Cupertino sorry guys!) is the one in Campbell. I like it because it is on the weekend and positioned right in the middle of town with good free parking. Being in town means the local shops and restaurants are also open should you need additional refreshment or retail therapy. Obviously this is quite a commitment and realistically unless you live on a farm or have access to a significant amount of land (unlikely if you live in Cupertino) then this option is only going to enhance rather than sustain your veggie stocks though-out the year. Having said that, growing your own is excellent for those special hard to get fruits and vegetables or where having them available to hand it not only convenient but just the best way to eat them. Freshly cut/picked fruits and vegetables maintain the maximum amount of taste and nutrition value. You don't need a lot of space to set up a modest vegetable garden and for those of you in apartments it is feasible to grow quite a lot in containers and pots, both indoors and outdoors, and/or on balconies and windowsills (also as my daughters will attest under fluorescent lamps in a darkened student studio). I planted my garden in a side yard and was surprise how much produce I could grow on such a small piece of land. The great thing about having a garden is how much control you have on what you grow and the varieties, not to mention the cost effectiveness. I will cover in future posts the setting up a vegetable garden and what to grow as this is a massive subject. But there are a number of great resources you can utilize if you are interested in setting up a garden. First thing would be to check out your local community colleges to if there a courses available. I found that the Master Gardeners of Santa Clara did a number of really good courses which can introduce you to all aspects of sustainable gardening in California. The Bay Area in particular is one of 5 areas in the world where it is possible to grow all year around. Secondly if you don't have land of your own then check to see if your city supports a community gardening program. They are to come by but many cities to have such program. I hope what is written above is useful and will help you make choices that are right for you at this time. The most important thing is as you journey on your own personal adventure is to talk about it with your friends and help them understand the values and commitments to such a lifestyle. Over the holidays I went to a number of social events (well you have to really) and at most of them at least one person came up and told me they had just read this book or watched that DVD about the problems with our food culture. The story I got was a familiar one, familiar because the same thing had happened to me. There are a lot books out there which tell you the many ways your industrial food system defined diet is going to kill you and there is nothing you can do about it. There are many DVD's which graphically portray the cruelty that many of the creatures that end up on your plate have endured getting there, and there is nothing you can do about it. It's the feeling of helplessness which you are left with which is the problem and was the main issue of the conversations I was having at these social gatherings (yes alcohol was served at many of them). 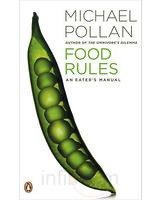 However this review is not about In Defense of Food, it is about Food Rules, An Eaters Guide which is Micheal's new offering. Micheal freely admits that simple as the above guidelines are they were still quite vague and clearly needed more expansion to further aid the confused eater. And so he has released this new book. The first thing you notice about the Food Rules is that it is small, compact in size. The idea was to provide a handy reference in rule form rather than a lot of details or background. Inside the book is basically organized in chapters around the three guidelines above and presents 64 rules (although that might be too strong) which add further definition around how to detect food, how much of it is appropriate, and why you don't need to turn Vegetarian or Vegan (unless you want to) in order to satisfy the last guideline. In short this is a handy book for the confused eater, read out of the context of other works such as In defense of food or some other resource on industrialized food it might not make much sense. In context or when, like the people I encountered, you just have questions, it makes a lot of sense, and I recommend it for your bookshelf. I am especially pleased about rule 64: "break the rules once in a while". Mainly because while writing this review I did snack on a packet of Smoky Bacon Crisps (Chips) I had brought back from the UK and just found in the cupboard. Ok this is a short post and I am afraid I am dragging my soapbox out for this this one. If you eat food (no matter where you live) the please listen to the first 5-10 mins of the Food and Farming awards podcast broadcast on the BBC radio 4 food programme. I know that the UK is faraway from Cupertino but the message in the introduction is common to California and the US as well and concerns the growing issues surrounding our current food system and our food culture in general. The slow food movement in the US is in a similar situation to the UK and as mentioned in the podcast it is a series of dots that need to be joined together. Well my friends you hold the pencil that does the joining. No massive marketing campaign of TV advert is going to be coming anytime soon as this very much a grass root movement. This whole podcast is basically an award show for slow food producers and purveyors in the UK the introduction by HRM Prince Charles (yep the guy that jilted Dianna) succinctly characterizes why this is important. The message is very much inline with the core objective of this blog. By all means listen to the whole podcast and even though it is speaking to the UK (which is smaller than CA) try this little exercise. For each award ask yourself who you would give the same award to in your area. If you have an answer tell someone else (tell all your friends, blog, twitter, facebook etc) if not then start asking around and see if anyone else might have a candidate. This is how Slowfood happens and the dots get joined. This time of year you probably have just settled down to look at your gifts and sitting somewhere is a lot of cardboard. And because your recycling is probably full of other recyclables (assorted bottles and cans!!) it will sit for a bit longer. Well if you have a particularly weedy patch of ground cardboard is a great mulch/weed barrier and this is a perfect time of year to lay it down. Used along with a more decorative mulch on top it will slowly rot down over the winter and when you are ready to plant in spring you will have a mostly weed free area to plant in. I did this last year and ended up with a weed free plot for my spring plants. To apply just cut an lay like a carpet, you can cut around established plants. Then spread over a decorative mulch and step back and admire your work. Perhaps with local craft beer or wine (from the Santa Cruz or Santa Clara valley). Well 2009 has been a tough year for me personally but I have come through it hopefully stronger, wiser and more committed. And one commitment or resolution I have made to myself for 2010 is to Blog more. I hope I can achieve what I set out to accomplish with this Blog which was to pass on information on how to source local and seasonal food, how to prepare it and when local is not possible other ethical options available. I have been living by these tenets for the last three years and I am amazed how much better I feel in myself and also how much cheaper and satisfying it is. This I managed two major tasks, firstly I started a garden (and an associated compost heap to maintain it). I managed to grow a lot of food and discovered that in this area growing things isn't really the problem, ensuring that you are the one that actually get to eat most of it is! I also starting to Brew beer again a craft I gave up in my twenties. More on the above and other things in future posts.